We have a number of resources available to download. These include a very informative snapshot from our Safer Pregnancy website and a helpful pictorial summary of some of the risk factors relating to stillbirth and neonatal deaths (including poverty, older mothers and mothers from some minority ethnic groups). These can be printed off and used for training or for posters and we can also provide printed A3 or A4 copies of either of these. These are ideal for all staff groups and for all organisations working with particularly those working or having contact with families or women. Copies of our fliers for the Margate Support Group and the Ashford Support Group can be downloaded here, as can copies of our general leaflet and our poster. Please feel free to pass these on or to ask us for printed copies. - between us we must raise awareness! There is no requirement for bereavement training for midwives and where training is provided, it is often very patchy. Here in East Kent we are very happy to provide training for midwives or other health or community based staff, usually at not cost whatsoever. We work in partnership with our Sands Central Office colleagues and sometimes provide this training in partnership with Child Bereavement UK. We have supported (and paid for) training days and workshops for hospital midwives, community midwives, GPs and admin staff, as well as support workers and volunteers at a number of family related organisations including Children's Centres. If you are interested in training – again for a short session or something longer, just get in touch with us or with the national Sands Training Team. A key part of our message is often sharing a parent’s personal experience of baby loss and sharing these can be really powerful in showing the effect of a baby death. This can be incorporated as part of any talk, workshop or training event. 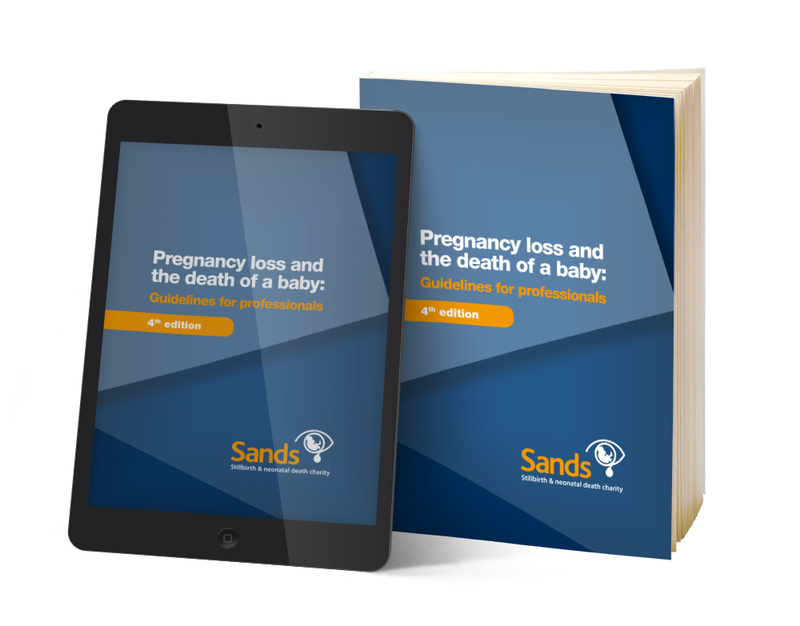 Sands has produced a range of booklets to support people affected by the death of a baby. These are available from the main Sands shop by using this link. The Sands UK web site also has a lot of other information - well worth a look! Feel free to order bulk copies of any of these leaflets. We too have small stocks of the booklets here in East Kent, and we can send these out to you, free of charge. The 4th edition of the Guidelines is based on research findings and on widespread discussions with health professionals, parents and voluntary organisations. It covers losses at any stage during pregnancy, including early and late miscarriage and termination for fetal anomaly, as well as stillbirth and care for very ill babies and those who are likely to die shortly after birth. As well as describing what constitutes good care, the Guidelines offer practical guidance on how to meet parents’ needs. The Guidelines are available to purchase in hard copy or electronic format. Order copies of the Sands Guidelines here. East Kent Sands has already provided around twenty-five copies of the Professional Guidelines to our main maternity staff and units and we are also willing to consider providing further copies - free of charge - because of their importance. Please contact us if you would like us to consider this. ‘NHS England welcomes this very comprehensive set of guidelines and it is right for maternity care providers to use it as a point of reference in delivering compassionate and effective bereavement care.’ Matthew Jolly, National Clinical Director for The Maternity Review and Women's Health, NHS England.